Members of the Melrose squad celebrate (picture by Douglas Hardie). Melrose registered Border League win number 20 in their history – and their third in succession – after coming from behind against Hawick in last night’s (Tuesday) Booker Border League Final. It was also the Greenyards side’s last team game before they enter the world of Super 6s next season, and the final chance to gain some XVs silverware from a season in which they’d uncharacteristically failed to win any prizes. 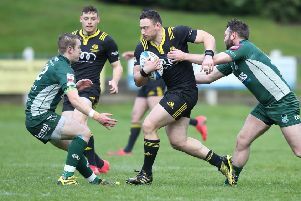 Hawick, meanwhile, are turning their attention to the new era for Scottish club rugby next season and their place in the ‘new’ Premiership – while this weekend, they host the latest in this season’s Kings of the Sevens contests. The final, at the Greenyards, produced a typical tense, close, feisty Borders derby. Spectators were treated to some early scoring action, as Lee Armstrong gave Hawick a second-minute lead with a penalty goal from near the 22. Melrose had replied by the fifth minute, as Bruce Colvine took a swift tap penalty and crossed the line for a try at short range. Hawick were penalised in the 19th minute for failing to release and Struan Hutchison stretched Melrose’s lead to 8-3 with the penalty goal kick. Armstrong was just off the mark with a 22nd-minute penalty while Melrose weathered a spell of Greens pressure near the line, before Colvine finally managed to clear with a fine kick. However, in 35 minutes, Dalton Redpath eluded a couple of Melrose defenders to score a try for Hawick, bringing them level, before Armstrong was successful with the goal extras to make it 8-10 at half time. The question was could Hawick build on this and record their 50th Border League win, or could Melrose rally and put at least one piece of silverware in the trophy cupboard. Hutchison edged the home side back in front early in the second half with another penalty, while Armstrong was unlucky to miss another kick for Hawick five minutes later, which would have tilted the advantage back their way. Hawick then had former captain Bruce McNeil sent to the sin bin – and Melrose produced what proved to be the winning score. On the hour mark, captain Grant Runciman scored from the back of a maul from the five-metre line to make it 16-10. Melrose: Crawford, Sim, Anderson, Wood, Mvelase-Julyan, Hutchison, Colvine, Shiells, Anderson, Young, Crookshank, Grieve, Knott, Runciman (c), Moody. Replacements: McLean, Brown, O’Sullivan, Wilde, Klein, Jardine, McWilliam. Hawick: Weir, Ford, Davies, Mitchell, Gordon-Wooley, Armstrong, Welsh, Muir (c), Carryer, Johnstone, Lowrie, D. Redpath, Linton, Graham, McNeil. Replacements: Renwick, Little, McKean, Lightfoot, Huggan, Welsh, A. Redpath.